Discover the various ways to get around Austin International Airport and find rides to your hotel near downtown Austin. As one of the country’s booming tech cities, making massive companies like Google, Dell, and IBM spring up like wildflower. With boundless opportunities and creative minds stirring about, unique flavors and eclectic stores follow the paths of the weird. This is especially true at Austin-Bergstrom International Airport. Before committing to fun, make sure nothing’s left behind by ensuring your vehicle’s taken care of. Enjoy the affordable luxury of dropping it off without worry at Family-Friendly Valet, located on the upper level of Garage 1 along Presidential Blvd - Executive Valet is located in the same area. 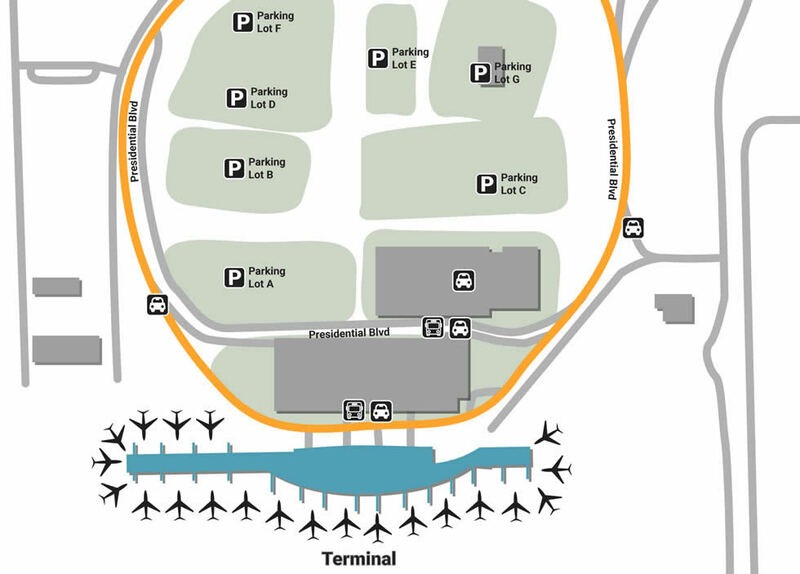 Head over to either Parking Garage 1 or 2 for the same daily/weekly rate, Garage 1 being the closest to the terminal and Garage 2 connecting to Garage 1. Long-term travelers should utilize one of the 6 Economy Lots (Lots B-G), open 24-hours a day and offering comfy shuttles. Nothing sets the mood of a vacation or business trip than how the scenery treats you, and if you treat Austin right it will do the same right back. Wherever you park, the airport offers complimentary jump starts, tire inflation, or late-night accompaniment. Relax on the South Terminal patio with complimentary Wi-Fi and easy listening access to the Music In The Air Program, which rings through the Barbara Jordan Terminal. The Barbara Jordan Terminal is also home to intimate lactation suites (Gate 7), an express spa (Gate 13), and an exclusive Admirals Club Lounge located upstairs. For those in need of quick access to a mailbox, visit the Ticket Lobby for several carriers. With so many cool stores lurking around each corner, it’s important to spend wisely, but also to consider getting something you’ll remember forever. Pick up a unique souvenir at the local hot-spot Austin Warehouse District (9), or enjoy the strangely diverse reading at Book People (11). If you’re a music-nut, take a tour through Waterloo Records for rare and popular vinyls, CDs, as well as locally-branded memorabilia. The facility is also home to luxury, from the leather handbags of Fifth & Congress (18) to the glamorous pallets at The Benefit Cosmetics Kiosk (5). Remember at every moment of every day that you’re worth feeling special, because in Austin, everyone is special. Find your soul at Hoover’s Cooking (7), a soul food restaurant that serves fried chicken, country sides, chicken & waffles, and sausage wraps that’ll send you straight to heaven. If you’re more in the mood for an All-American lunch, walk over to Hill’s Cafe next-door. Try out some infamous Austin Tex-Mex by surprising your taste buds with Nuevo Leon Mexican family recipes. Be sure try The Salt Lick Bar-B-Que’s (12) famous ribs before leaving Texas , though the family-owned Wok & Roll (8) unique mix of flavors is just as worth stopping for.